Emma has designed her own paint range and not only sells a great colour range but shows you how and what to do with it! 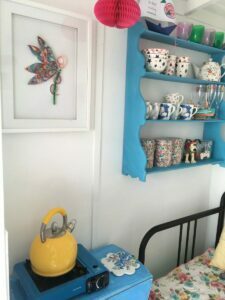 If you’ve read my recent blog on How I created Isla, you’ll know that I used two of the brighter colours in Emma’s range when decorating our two new beach huts for hire. 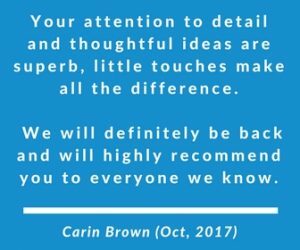 Emma’s page quickly became a firm favourite of mine and was so pleased when she said yes to being in one of our ‘Featured Supplier’ Series. Knowing that her talents expand into commissioned furniture and painting workshops, I caught up with Emma, to find out more about her and her business Vintage Rocks. Tell us a little bit about your business. What inspired you to start it and how has Vintage Rocks developed? It all started when I become a single parent and desperately wanted to have a lovely home for my two kids but was on a minuscule budget. I trawled eBay for bargain second hand furniture and got lots of materials from B&Q to paint it with. It was hard going – all that sanding, priming, egg shelling … I didn’t enjoy painting furniture at all. 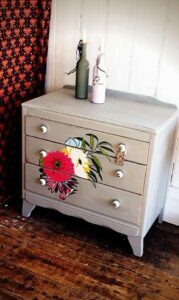 That was until I discovered Annie Sloan Chalk Paint. I realised that I didn’t need to sand or prime anymore and I became addicted to up-cycling furniture. I posted a couple of photos on Facebook and got lots and lots of likes! It was then that I decided to set up a Facebook page, Vintage Rocks. Designed a logo and gradually slipped into being a professional furniture painter. I was asked by a local restaurant to paint a huge dresser for their opening night. It was my very first commission. The quote that I gave them was based on using Annie Sloan chalk paint and because of the price of the paint, it worked out way to expensive for them to even consider. One of the tradesmen that was working there told me about a local paint factory and suggested I go to speak to them. That’s when Vintage Rocks paint was born. I was thrilled that they were able to make a paint for me that ticked all the boxes. Smooth with no brush marks, excellent coverage, quick drying, low odour, no nasty chemicals or solvents and I could finally come within budget on my paint projects. 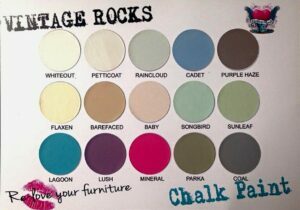 Vintage Rocks has since moved production to a factory in Stroud and, as well as selling our paint online, we have also started our journey as a wholesaler, with 9 independent retailers currently on board with lots more in the pipeline. I don’t get much time to paint furniture now but hoping this will change soon as I start outsourcing more and some of the processes become automated. 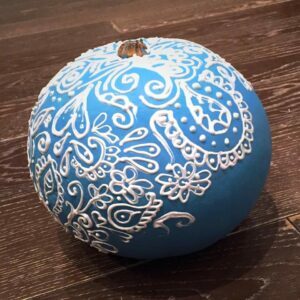 Your paint has so many uses and I’ve loved seeing so many different uses in your facebook group. How did you decide on the colours to stock? I went with my gut feeling on colour choices. I picked colours that I liked personally and knew I would like to use on my own projects. It worked out beautifully as each and every one of them co-ordinates. You can’t go wrong. Customers also like to mix our existing palette to come up with their own custom shades. I’ve spotted some amazing items refurbished with your paint. What’s been the most unusual piece so far? I haven’t come across a surface that can’t be painted with Vintage Rocks paint yet. Gloss Ikea units, metal front doors, kitchen cupboards, clocks and plastic storage drawers have all been painted but I would say the most unusual was a pumpkin that I painted in “Lagoon” for the Teal Pumpkin Project. I was so sad when I it started to go rotten and I had to throw it away! I love seeing what other people create with our paint. We have a Facebook Group, Vintage Rocks Inspiration where customers post “before and after” photos of their projects. It’s amazing to see the imagination and different styles and techniques that go into each piece. When I’m at craft fairs I have people rushing up to me to show me a photo on their phone of something they’ve painted when they didn’t previously realise they could be creative at all. Family is everything to me. 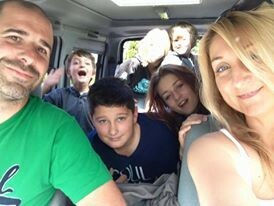 My partner and I have 6 children between us so we have some really huge days out and holidays! We’ve just booked a holiday to Mallorca where I will be in my absolute element … kids splashing in the sea whilst I sit on the balcony watching them with a glass of red wine in hand! 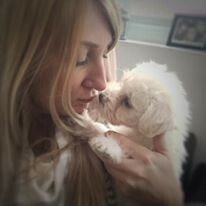 The only thing that will be missing is my little puppy Otis. I love seeing your gorgeous dog Otis in Snapchat – what’s your favourite thing about being a dog owner? Otis is a spoilt little puppy and he sleeps at the end of my bed every night! In the morning, he’ll come and lie on me with his face nuzzled into my neck and all 4 paws up in the air. It’s a struggle to get up because we get so snuggly! Running a small business can be tough at times – what’s been your biggest challenge so far? There have been lots of challenges along the way but I can honestly say that each crisis has had a silver lining and something bigger and better rises from the ashes. Having said that, it is hard to remember when you’re right in the middle of a disaster! My ongoing challenge is to strive for progress rather than perfection! I will sometimes put things off or spend too much time on something because I want it to be absolutely perfect. I’ve started reading the book “How to be an Imperfectionist” by Stephen Guise which is very inspiring and I’m hoping that I’ll be able to let go a little bit and “colour outside of the lines” now and again! What would be your top three tips for starting a new business? 1. Expect the unexpected. Plan where you can but be prepared for unforeseen problems and rise to the challenge. It will all work out for the best. 2. Outsource. I’m lucky that I have an admin, marketing and retail background so I’m capable of doing a lot of stuff myself. What I’ve come to realise is that doing everything yourself can be really draining and stressful and there are people out there that can do the job better, freeing you up to do what you specialise in. 3. Don’t forget to have fun. You probably started your own business because you wanted to get away from the mundane 9-5 rat race, find your creativity and do something for yourself. It’s easy to lose sight of that vision. As soon as it starts to get stressful, take a break and refer to tip 1 and 2! What’s the most exciting thing on the horizon for Vintage Rocks? I’ve been asked to appear on the Create and Craft channel, demonstrating and selling Vintage Rocks products. Very exciting but also extremely nerve-wracking appearing on live telly!